The terror group Islamic State claimed responsibility for an attack in Egypt that targeted a Coptic Christian church in a Cairo suburb, but the group did not provide any evidence to back up its claim. The gunman first shot at a Christian-owned shop, killing two people, Friday before proceeding to the Mar Mina church in the southern Cairo suburb of Helwan, the Coptic Church said according to Reuters. The Interior Ministry said he opened fire at the entrance to the site and tried to throw an explosive device. The attacker was wounded by security forces and taken into custody, Egypt's Interior Ministry said. Church officials had said those killed ranged in age from 43 to 90. Islamic State in a message through its Amaq media agency that soldiers of “the Caliphate” attacked Christians and said one attacker was killed, according to security consulting firm and NBC News partner Flashpoint Intelligence. But because the group provided no evidence it is unclear whether Islamic State was involved or whether the gunman was inspired by the group, or if there is no connection. U.S. President Donald Trump spoke with Egyptian President Abdel Fattah al-Sisi and offered his condolences, according to a statement from the White House. "President Trump condemned the attack and reiterated that the United States will continue to stand with Egypt in the face of terrorism," the White House statement said. The attacker was identified by Egypt's Interior Ministry as Ibrahim Isma'il Isma'il Mustafa, 33, and the ministry said he was involved in several prior terrorist attacks. Earlier reports by security sources and state media said at least two attackers were involved in Friday's attack, and that one was shot dead and another fled the scene. The interior ministry did not explain the reason for the different accounts. 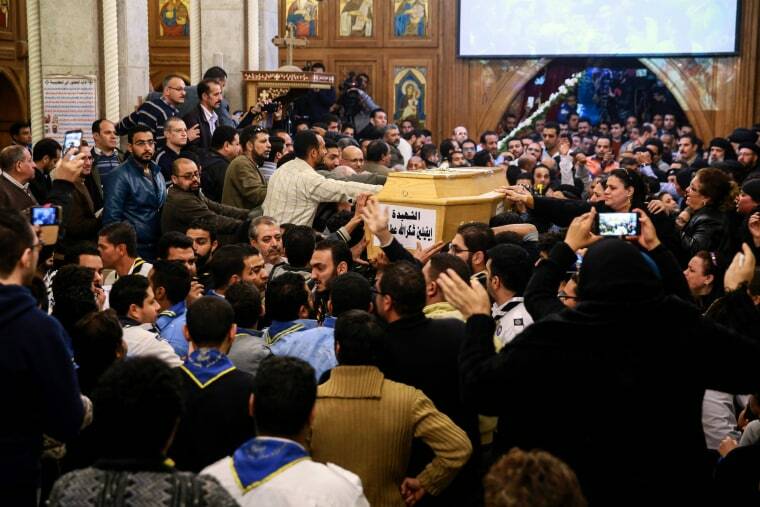 Islamist militants have claimed several attacks on Egypt's large Christian minority in recent years, including two bomb attacks on Palm Sunday in Apriland a blast at Cairo's largest Coptic cathedral last December that killed 28 people.